Time and resource constraints necessitate increasingly early decisions to advance or halt pre-clinical drug discovery programs. Early discovery or “tool” compounds may be potent inhibitors of new targets, but all too often they exhibit poor pharmaceutical and pharmacokinetic properties that make early assessment of in vivo efficacy difficult. 1,3-Dicyclohexylurea, a potent and selective inhibitor of soluble epoxide hydrolase (sEH), reduces blood pressure in hypertensive preclinical animal models when administered intraperitoneally using DMSO/corn oil as a delivery vehicle. However, the poor aqueous solubility of DCU poses a challenge for in vivo dosing in a multiple dose situation. Therefore, we developed a nanosuspension formulation of DCU to support oral, intravenous bolus and intravenous infusion dosing. Use of the nanosuspension formulation maintained DCU free plasma levels above the sEH IC50 and demonstrated that the application of formulation technology can accelerate in vivo evaluation of new targets by enabling pharmacodynamic studies of poorly soluble compounds. The pharmaceutical industry has increasingly adopted a programmatic fail-fast/fail cheap paradigm in an effort reduce costs and deploy resources in an efficient manner . Early assessment of the pharmacodynamic response of a target to drug administration may facilitate an early “go” or “no go” decision for a program based upon results from an in vivo efficacy model. However, tool compounds or discovery screening hits often exhibit poor physicochemical properties, solubility and pharmacokinetic attributes, making in vivo activity assessment difficult due to low exposure levels. Formulation-based approaches to improve exposure to tool compounds, such as the addition of organic co-solvents, may interfere with the pharmacodynamic readout of the in vivo model or may not be tolerated if sustained systemic levels are required, as in the case of a multiple dose situation [2, 3]. The use of novel biomaterials and polymeric delivery systems may also be tenable [4, 5], although these tools are more likely to be applied in a drug development environment. Nano and micro particle drug delivery systems have been applied throughout the pharmaceutical industry, and such systems have mainly focused on oral, intraperitonel, intramuscular, or subcutaneous delivery [6, 7]. The primary advantage of such delivery systems is to take advantage of increased surface area to enhance the overall dissolution rate. For example, oral dosing of nanosuspensions is commonly used to increase the bioavailability of a compound for which absorption is controlled by dissolution rate without the addition of a large amount of organic co-solvents. The use of nanoparticles in IV formulations for water insoluble drugs has been studied previously [8–12]. Despite the use of nano and micro particles for IV injection, utilization of nanoparticles for IV infusion has not been well characterized. This has limited the use of such technology in pre-clinical research where prolonged and constant exposure is needed to validate targets with less-than-ideal tool compounds to enable a data driven decision without significant upfront investment. Considering these challenges, we developed a general nanosuspension formulation that minimized organic co-solvent, was easy to prepare and was applicable to an IV infusion or multiple dose study. 1,3-Dicyclohexylurea (DCU) is a potent inhibitor of soluble epoxide hydrolase, or sEH . Anti-hypertensive efficacy following a single dose of DCU has been demonstrated in spontaneously hypertensive rats [14, 15]. Inhibition of sEH by DCU leads to an increase in epoxyeicosatrienoic acids (EETs). EETs are P450-derived metabolites of arachidonic acid and are well established regulators of cardiovascular and renal function . EETs possess vasodiliatory properties that maintain vascular tone, particularly in the renal , mesentery  and coronary arteries . Urea-based compounds, such as DCU, have been found to be potent and selective inhibitors of sEH . Since DCU and many of its urea analogs exhibit poor aqueous solubility, targeted synthetic efforts have been initiated to increase chemotype solubility [20, 21], and heroic dose formulations of DCU have been used to study its in vivo efficacy as a sEH inhibitor . Despite these efforts, the pharmacokinetic/pharmacodynamic relationship of DCU plasma concentration to sEH inhibition is not well understood in part due to the poor pharmaceutical properties of DCU. Considering its poor pharmaceutical properties and its usefulness as a potent inhibitor of sEH, DCU was a good candidate for nanosuspension formulation. HPLC grade acteonitrile was obtained from Burdick & Jackson (Muskegon, MI). All other chemicals used were purchased from Sigma-Aldrich (St. Louis, MO) and were of the highest purity available. Lead free glass beads (0.5–0.75 mm) were purchased from Glenn Mills, Inc (Clifton, New Jersey). For particle size reduction, an internally developed bench scale wet milling (micronization) device was used . To make the stock nanosuspension formulation of (10 mg/mL) DCU, an appropriate amount of glass beads, and 1% (w/w) Cremophor EL in phosphate buffered saline (pH 7.4) were added in a scintillation vial. The mixture was then stirred at 1,200 rpm for a period of 48 h with occasional shaking. The stock formulation was then harvested and potency, particle size, and solid-state properties were checked. Particle size distribution was determined on a Beckman Coulter LS 230 particle size analyzer using the small volume accessory (Miami, FL). A polarized intensity differential scattering (PIDS) obscuration water optical model was employed. Particle size distribution was computed by the software using Mie scattering theory. There was no absorption by DCU at the laser line (750 nm) so the complex index of refraction was determined by finding the average refractive index of DCU (1.57) by microscopy. Index matching fluids from Cargille (Cedar Grove, NJ) were employed. Powder X-ray diffraction (PXRD) was carried out using a Bruker D-8 Advance diffractometer (Madison, WI). The system used a copper X-ray source maintained at 40 kV and 40 mA to provide radiation with an intensity weighted average of (Kαave) 1.54184 Å. A scintillation counter was used for detection. A Göbel mirror was used to eliminate Kα radiation. Beam aperture was controlled using a divergence slit of 0.6 mm and a primary 4° Soller. After diffraction, a secondary Soller was used to ensure collimation of the diffracted beams. Data were collected using a step scan of 0.02° per point with a 1 s/point counting time over a range of 3–35° 2θ. In house fabricated aluminum inserts or inserts with a Hasteloy sintered filter (0.45 μm) pressed in the center and held in Bruker plastic sample cup holders were utilized for all analyses. Dry DCU was run as received without hand grinding. Suspensions were filtered onto sintered filters under vacuum. In addition to the PXRD, thermal gravimetric analysis with simultaneous differential thermal analysis (TGA/STDA) was used to ensure no solid form changes. The bulk material was reduced from 40 to 0.5 μm with a final D 50 of 0.45 μm. The solid form of the micronized material was checked by PXRD and TGA/SDTA. There was no discernable change in crystal form during the micronization process . For the IV bolus dose, the formulation was prepared by diluting the stock nanosuspension preparation (10 mg/mL) with 1% (w/w) Cremophore EL in phosphate buffered saline until the desired concentration was reached. For the IV infusion dose, the formulation was prepared by diluting the stock nanosuspension solution (10 mg/mL) to twice the desired target concentration by diluting with 1% (w/w) Cremophore EL in phosphate buffered saline and then further diluting with 1% (w/w) Cremophore EL in phosphate buffered saline containing 20% PVP (w/w). Final solutions were tested for concentration using the analytical methods described below. The total dissolution time and risk assessment for the IV formulation was conducted by measuring the plasma solubility of DCU, particle size of the nanoparticles and the diffusion coefficient of DCU in rat plasma. Both Noyes–Whitney and Hixson–Crowell cube root laws were used in the calculation in a conservative way. The calculation was conducted by assuming the diffusion layer thickness is close to the mean particle size and all particles are uniformly sized. The complete dissolution time for each particle was estimated to be less than a minute upon injection . The dissolution time was calculated without the considering the advantage of the turbulent blood flow in the vein, which should serve to further reduce the diffusion boundary thickness, rapidly disperse the initial injection volume and minimize local concentration effects. Thus, the DCU nanoparticle formulation is expected to have instant and complete dissolution in the blood upon the IV injection and infusion. The LC/MS system was comprised of an API 4000 triple quadropole mass spectrometer with an atmospheric pressure electrospray ionization source (MDS SCIEX, Concord, Ontario, Canada), and two LC-10ADvp pumps with a SCL-10ADvp controller (Shimadzu, Columbia, MD). A Thermo Electron Aquasil-C18 column (2.1 × 20 mm, 3.0 μ, Waltham, MA) was used for separation with initial conditions of 10% B, followed by a gradient of 10% B to 90% B over 1 min (solvent A 0.1% formic acid, solvent B 100% acetonitrile), 90% B was held for 0.5 min, followed by an immediate return to initial conditions that were maintained for 0.5 min with a flow rate of 0.5 mL/min. The compounds were detected by an API 4000 triple quadropole mass spectrometer with an atmospheric pressure electrospray ionization source (MDS SCIEX, Concord, Ontario, Canada). Using the positive ion mode, protonated molecular ions were formed using an ion spray voltage of 5,000 V, declustering potential of 76 eV, entrance potential of 10 eV and source temperature of 600 °C for DCU. Using the positive ion mode, protonated molecular ions were formed using an ion spray voltage of 5,000 V, declustering potential of 86 eV, entrance potential of 10 eV and source temperature of 600 °C for carbamazepine. Product ions formed at a collision energy of 23 eV for DCU (m/z 225.1 → 100.1) and at a collision energy of 27 eV for carbamazepine (m/z 237.1 → 194.3). Male Sprague–Dawley (SD) rats weighing 250–300 g were purchased from Charles River Laboratories (Wilmington, MA) and acclimated to their surroundings for approximately one week with food and water provided ad libitum. On the day prior to study animals were anesthetized with isoflurane (to effect) and then implanted with BASi vascular catheters (West Lafayette, IN) in the carotid artery and jugular vein. Animals were acclimated in Culex cages (BASi) overnight prior to dosing. Patency of the carotid artery catheter was maintained using the “tend” function of Culex automated blood sampler. For oral studies (suspension dose: 3 mg/kg,n = 3 animals; nanosuspension dose: 10 and 30 mg/kg,n = 3 animals) were dosed via oral gavage. For IV bolus (solution dose: 3.0 mg/kg,n = 3 animals; nanosuspension dose: 2.5 mg/kg,n = 4 animals) and infusion studies (nanosuspension dose: 4.3 mg/h/kg,n = 4 animals), animals were dosed via the jugular vein catheter. For the IV bolus study, the injection volume was controlled at 1 μL/g of body weight and for the IV infusion study the infusion rate was controlled at 1 mL/h for a period of 3 h. Blood collections were performed by the Culex at 0.083, 0.25, 0.5, 1, 2, 4, 6, 8, and 12 h time points for the IV bolus and oral nanosuspension doses. Blood collection time points for the IV infusion study were 0.25, 0.5, 1, 1.5, 2, 3, 3.5, and 4 h. These animal studies were approved by the St. Louis Pfizer Institutional Animal Care and Use Committee. The animal care and use program is fully accredited by the Association for Assessment and Accreditation of Laboratory Animal Care, International. Plasma protein binding measurements were performed using a 96-well plate equilibrium dialysis method that has been described previously . Equilibrium dialysis was performed using pooled, heparinized rat plasma at a final DCU concentration of 10 μM at 37 °C for 4 h.
Pharmacokinetic parameters were estimated using WinNonlin Professional®(version 4.1, Pharsight Corporation, Mountain View, CA). 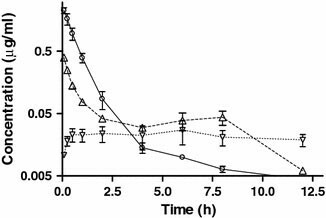 A two-compartment, first order model (WinNonlin PK model 7, IV-Bolus) was selected for pharmacokinetic modeling of the IV bolus concentration versus time data. A two-compartment, first order model (WinNonlin PK model 9, IV-Infusion) was selected for simulation of the IV infusion data. Estimated parameters ofV 1(central volume of distribution, 1285.3 mL),k 10(elimination rate, 1.62 h−1),k 12(rate of distribution from compartment 1 to compartment 2, 0.224 h−1), andk 21(rate of drug distribution from compartment 2 to compartment 1, 0.166 h−1) obtained from modeling the nanosuspension IV bolus dose were used to simulate plasma concentrations for the IV nanosuspension infusion experiment. 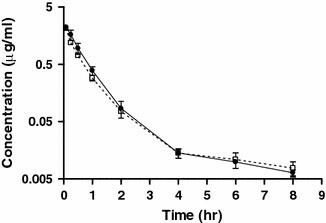 To examine the PK parameters of commercially available DCU, we dosed SD rats using 3 mg/kg IV bolus, oral solution and oral suspension administration methods and generated corresponding plasma concentration versus time curves (Fig. 1). The IV bolus treatment exhibited a biphasic log-linear curve with a prolonged terminal half-life. The suspension dose exhibited an extended absorption profile with a T max of 2 h and a C max of 0.024 μg/mL, consistent with solubility/dissolution rate-limited absorption. To determine if reducing DCU particle size would improve compound exposure, a 30 mg/kg oral suspension and two oral nanosuspension doses (10 and 30 mg/kg) were administered to SD rats. Plasma concentration versus time curves for the 30 mg/kg oral suspension and two oral nanosuspension doses (10 and 30 mg/kg) are shown in Fig. 2. C max values for the 10 and 30 mg/kg nanosuspension doses were 27- and 35-fold greater than the unmilled suspension dose, and plasma concentrations were 3.7- and 15-fold higher for the nanosuspension doses at 6 h, respectively. Thus, nanosuspension formulation produced more rapid and complete oral absorption of DCU. If the nanosuspension formulation enabled very rapid dissolution of DCU, then the pharmacokinetic profile of a DCU nanosuspension administered by IV should be very similar to the profile of an IV solution. 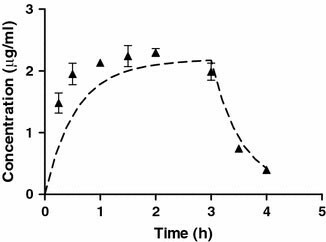 To address this, a two-component, first order pharmacokinetics model was used to fit the plasma concentration–time curve following a 3 mg/kg solution or 2.5 mg/kg nanosuspension IV administration of DCU (Fig. 3). Pharmacokinetic parameters were calculated using the WinNonlin pharmacokinetic software package and are listed in Table 1. The nanosuspension and solution-based IV doses exhibited clearance values of 33.6 and 34.7 mL/min/kg, respectively, and fast initial half-lives of 0.37 and 0.37 h, respectively. Other pharmacokinetic parameters (volume of distribution, mean residence time and elimination half-life) were similar when comparing the nanosuspension dose (3020 mL/kg, 1.5 and 4.8 h, respectively) to the solution dose (2149 mL/kg, 1.07 and 3.9 h, respectively). These results reinforced the in vitro prediction of the diffusion coefficient and plasma solubility of the DCU nanosuspension, which indicated that dissolution would likely take place in less than one minute . Despite the greatly improved plasma exposures of the nanosuspension, the short half-life of DCU limited the ability to achieve sustained plasma concentrations. An IV infusion is a practical approach to introduce sustained levels of compound over a matter of hours, or longer, with the aid of an implanted pump. To evaluate the predictability of an IV infusion of the DCU nanosuspension, a two-component, first order pharmacokinetics model was used to simulate and predict plasma concentration versus time for a 3-h nanosuspension IV infusion dose based upon pharmacokinetic parameters estimated from the nanosuspension IV dose (Fig. 4). Experimentally determined plasma concentrations during the infusion phase were higher than the predicted values, while experimental and predicted plasma concentration values matched following termination of the infusion (Fig. 4). Administration of DCU formulated in DMSO/corn oil (3 mg/kg, interperitoneal dosing) has been demonstrated to lower blood pressure in the spontaneously hypertensive rat (SHR) model . However, plasma concentrations were not reported for the experiment. 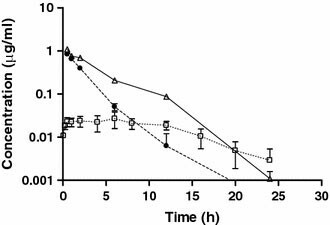 For an initial assessment of pharmacokinetic characteristics, DCU was administered to Sprague–Dawley rats at 3 mg/kg using IV, oral suspension and oral solution formulations. Due to the high plasma protein binding of DCU (97%), a systemic plasma level of 0.672 μg/mL was needed to reach the literature-determined IC50 of DCU (90 nM, 0.020 μg/mL) in terms of free plasma concentration . While plasma concentrations above 0.672 μg/mL were obtained using 3 mg/kg IV bolus dosing, systemic levels above the IC50 were not maintained for greater than 1 h due to the poor pharmacokinetics profile of DCU. Neither the oral solution nor the oral suspension doses reached free plasma levels above the IC50. Comparison of the oral solution and suspension data indicated that DCU exhibited good permeability in vivo and suggested that the extended absorption phase of the suspension dose was dissolution rate controlled. Since minimal increases in exposure were obtained by increasing the suspension dose (up to 30 mg/kg) and the high organic content of the solution dose (70% PEG) was inappropriate for the efficacy model, we turned to micronization for formulation into a nanosuspension as a potential alternative to improve the exposure levels of DCU. Due to ease of administration in a multiple dose situation, oral dosing of the nanosuspension was examined initially. While both 10 and 30 mg/kg doses of the nanosuspension reached plasma concentrations surpassing the free IC50, necessary plasma levels were not maintained for greater than 2 h. Simulation of the data indicated that tid or qid dosing would be required to maintain desired plasma levels. Due to the inconvenience of those dosing regimes and the desire to minimally disturb the animals for blood pressure studies, intravenous studies were examined. The pharmacokinetics profile of a 2.5 mg/kg dose of DCU nanosuspension closely matched the profile of the IV solution dose (Fig. 3). The pharmacokinetics results reinforced the in vitro-determined diffusion coefficient, plasma solubility, and complete dissolution time of the DCU nanosuspension, which indicated that dissolution would likely take place momentarily upon IV dose. The similarity in pharmacokinetics profile also suggested that organ accumulation, a problem often encountered with IV nanosuspension dosing [7, 24], did not occur. While the IV formulation was well tolerated, infusion studies were necessary to maintain needed plasma levels. The consistency observed between solution and nanosuspension IV formulations supported our modeling and demonstrated that upon injection, the DCU nanoparticles dissolved instantaneously and completely in the blood. Otherwise, a significant change of the pharmacokinetic profile might be expected. The infusion study (Fig. 4) maintained free plasma levels three-fold higher than the in vitro IC50 for a 3-h period. The studies also indicated that the nanosuspension infusion pharmacokinetics profile could be predicted with reasonable accuracy based upon the nanosuspension IV data. The formulation did not alter blood pressure in normotensive animals over the time of the infusion, and the animals did not show adverse effects to the formulation. More importantly, these experiments demonstrated that nanosuspension formulations can be used to enhance exposure of compounds with low solubility and poor pharmacokinetic characteristics for early decision-making in a drug discovery environment. One of the biggest hurdles facing the pharmaceutical industry today is the need to lower costs and move products to the market in a timely manner. Therefore, early target validation and assessment without a large up front investment is becoming critical. The use of nanoparticle parenteral drug delivery systems for oral, IV injection and IV infusion of tool compounds to reach desired exposures allows researchers to obtain reliable and critical data for early decision making early in the discovery process without large investment by utilizing less-than-ideal, prototype compounds for target validation. This study was supported by Pharmacokinetics, Dynamics and Metabolism at Pfizer.